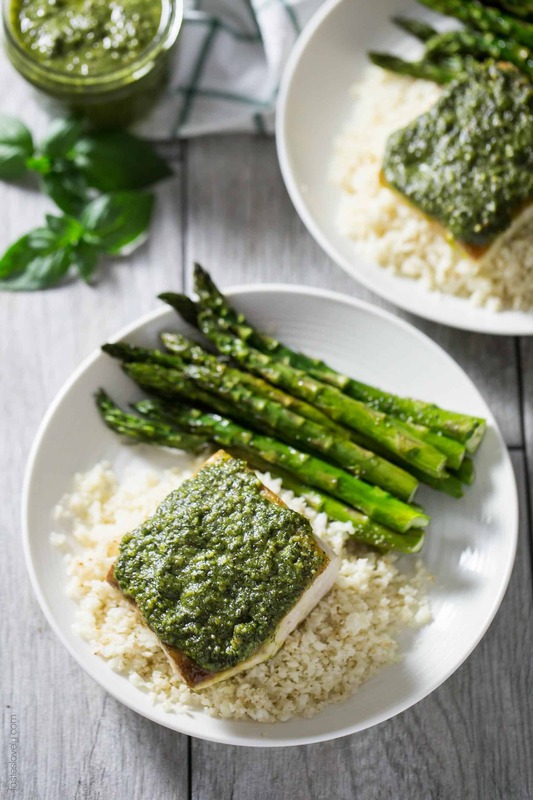 Pesto Mahi Mahi – Pan seared then oven baked mahi mahi topped with a dairy free pesto. 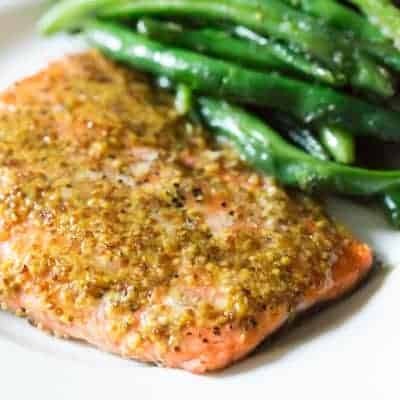 A simple and fresh fish dinner recipe that is paleo, gluten free, Whole30, low carb and dairy free! We planted 8 basil plants in our garden this year, and now I have a practically endless supply of basil. It is the best problem ever. I love growing basil because the more you clip it, the more it grows back! So I have been clipping my basil every week, and using all the fresh basil leaves to make my dairy free pesto, which we are OBSESSED with in my house. Even the baby loves it. Every week I have enough fresh basil to make 2 jars of my dairy free pesto. I keep my pesto in wide mouth pint mason jars. Bonus is that the wide mouth mason jars are freezer safe! So I keep 1 of the jars in my fridge that we’ll use throughout the week, and I freeze the other jar to stock up for winter time. My pesto freezes beautifully, and thanks to my plentiful garden I can now enjoy homemade pesto all year round. 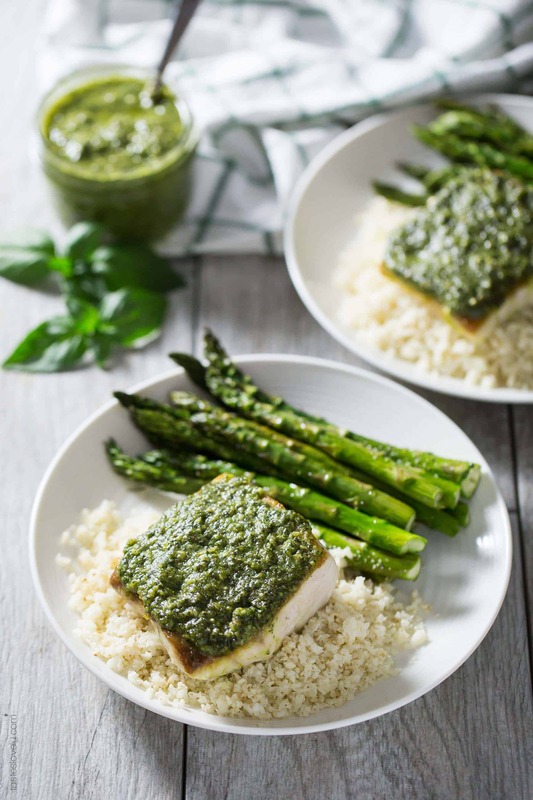 One of my favorite ways to use my pesto is on top of mahi mahi! 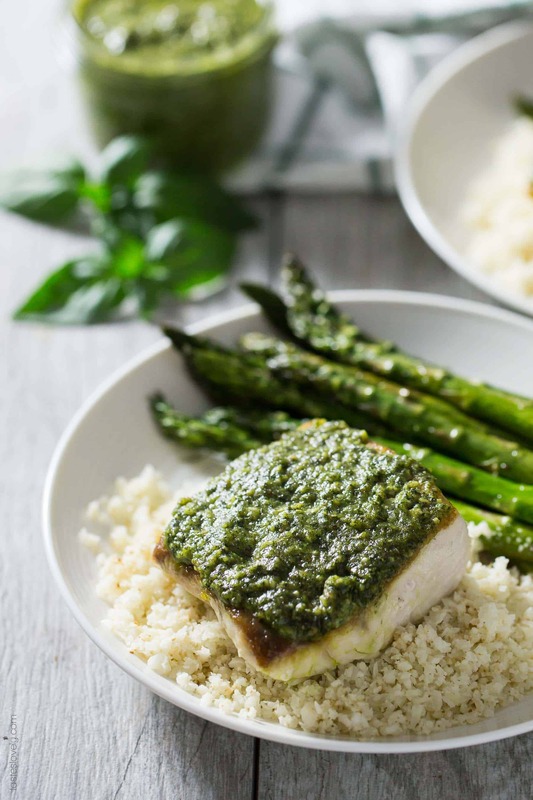 Mahi mahi is a netural tasting, meaty fish, so the pesto flavor can really shine through. I get my wild caught mahi mahi frozen at Costco. But you could really use any neutral tasting fish. Halibut, cod, tilapia, even salmon! I sear the mahi mahi in olive oil for just 2 minutes in a pan so it gets crusty and golden brown. Then I top it with the pesto and finish baking the fish in a 300º oven. 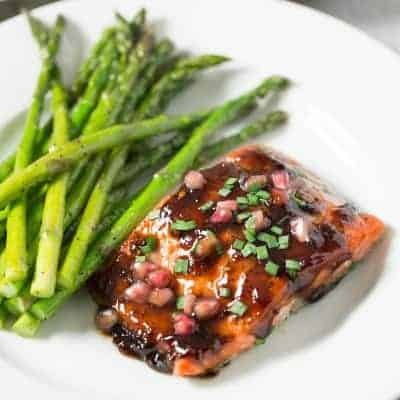 By finishing the fish in the oven at a low temp, the fish comes to heat gently and stays juicy and won’t dry out. It’s my favorite method for cooking fish. The fish will bake in the oven for about 7-10 minutes until it has an internal temperature of 135º. I love using my instant read thermometer – my meat and fish are cooked to the ideal temperature every time. 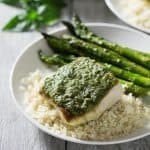 I like serving my pesto mahi mahi with cauliflower rice and an in season vegetable. I got some gorgeous asparagus at the farmers market, and it was the perfect addition to my pesto crusted fish dinner. The husband AND the baby love this dinner! My 1.5 year old ate an entire 8 ounce filet all to himself! Great way to get kids to eat fish. Who can resist pesto? This dinner is very healthy, so I love that my family loves it. 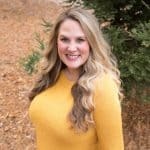 Paleo, Whole30, gluten free, grain free, dairy free and low carb. Pat the fish dry, and season with salt and pepper. Preheat a large oven safe skillet over medium high heat. Add the olive oil. Sear the fish for 2 minutes, or until golden brown. 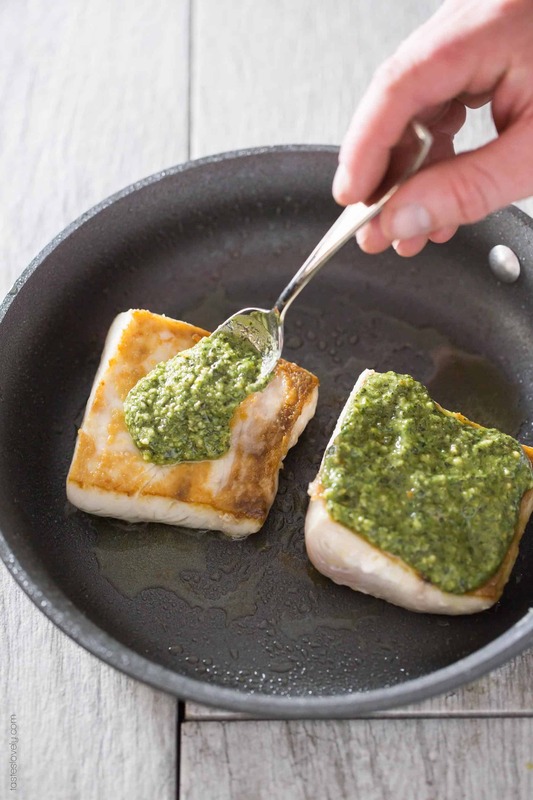 Flip the fish, then top each filet with a heaping tablespoon (or more depending on the size of your filets) of the dairy free pesto. 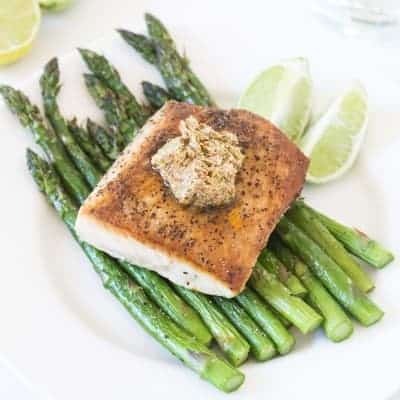 Transfer the skillet to the oven, and cook until the fish reaches an internal temperature of 135 degrees, about 7-10 minutes depending on how thick your fish filet is. Remove from the oven, and serve warm. I like serving mine with cauliflower rice and an in season vegetable.